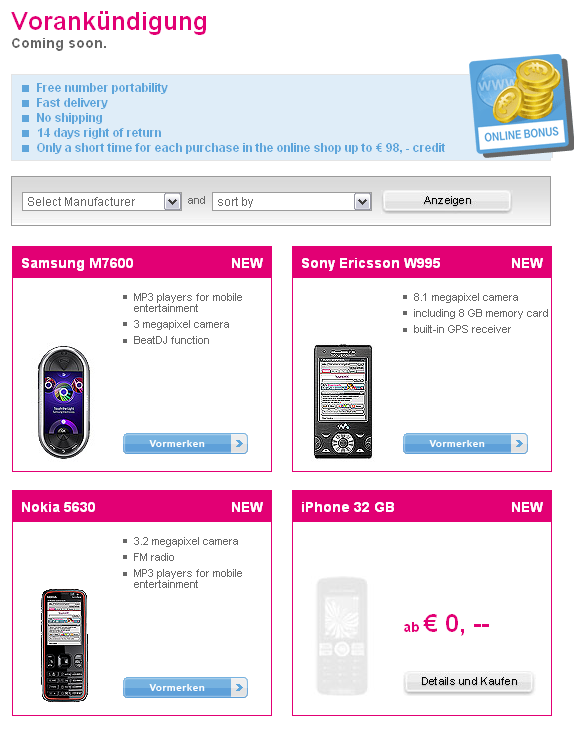 Take it for what it's worth (which may be nothing, quite honestly), but a bona fide "iPhone 32GB" placeholder has appeared in the 'Coming Soon' section on T-Mobile Austria's website. Generally speaking, we wouldn't give this kind of slip too much credence, but considering that a similar slip at T-Mobile Germany was accurately foretelling two years ago, we're cautiously optimistic that all those rumors of a more capacious iPhone are legitimate. We hate to remind you that loads of smoke generally leads to fire, but hey, June 8th ain't too far off anyway. Larger screen cap (of the translated-to-English site) is just past the break. Update: Seems the admin yanked the 32GB iPhone from the page -- oopsie! Update 2: Looks like Vodafone Australia has sent out a notice that the 16GB iPhone has been deemed "End of Life" by Brightpoint, who supplies its iPhones. Are you thinking what we're thinking?